CHiPs for Kids Toy Drive needs your help to collect 1,000 more toys by Dec. 20, so local disadvantaged kids can have their presents in time for Christmas. 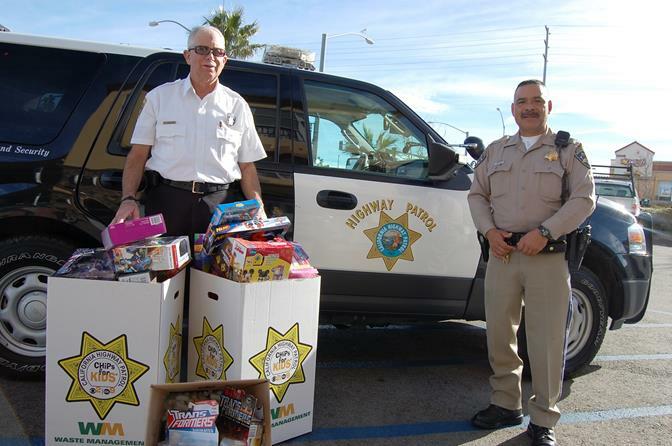 LANCASTER – The Antelope Valley California Highway Patrol has managed to collect more than 3,400 toys in the past 18 days alone. More than 2,000 of those toys have already been distributed to disadvantaged kids throughout the local community, according to CHP officer Gil Hernandez. The local CHiPs for Kids Toy Drive needs your support now more than ever, Hernandez said, because the group is trying to obtain at least 1,000 more toys before the end of this week. Local CHP officers on Tuesday were donating their time to collect toys at the Walgreens on 50th Street West and Avenue N. On Wednesday, CHP officers will be collecting toys at the Walgreens on 47th Street East, near Avenue S in Palmdale. And on Thursday and Friday, officers will be at the local Sam’s Club. To donate to this cause, visit any of the following locations to drop off a new, unwrapped toy in the CHiPs for Kids collection box: local Walgreens, local Walmarts, Sam’s Club, Red Robin at the Antelope Valley Mall, Camacho Auto sales, or the local CHP office (2041 W Avenue I, Lancaster). The toy drive ends this Friday (Dec. 20), so be sure to drop your donation off before then. “For those residents that want to support their community, we’re asking them to help us by donating toys, so we can put smiles on children’s faces for the holidays,” Hernandez said. For more information of the CHiPs for Kids Toy Drive, contact the local California Highway Patrol office at 661-948-8541. 2 comments for "CHiPs for Kids Toy Drive needs your support"
Thank you from the bottom of my heart to all California Highway Patrolmen for their generous holiday spirit! Thank you officer Hernandez! I know some of the families who benefited from the toys you collected and they are grateful. Happy Holidays to you and all who worked so hard on behalf of children in the Antelope Valley.